The story in previous Monster Hunter games has always been quite limited. The series has never had an especially captivating narrative: there’s a big monster, that big monster will destroy everything and everyone, you turn out to be the one person who can save the world by killing said big monster. Monster Hunter World, though, is promised to have a “nice, meaty story” that should hopefully give some substance to the narrative. For more of our Gamescom 2017 coverage, check it out here. The recent Wildspire Waste trailer did hint at that in its last few seconds. My guess is that the ‘World’ part to the title is referring to the possibility that the world itself is a monster, and it’s all going to get a bit absurd, in a good way. Anyway, the promise of the game’s story comes from an interview Arekkz, a popular Monster Hunter-focused YouTuber, had with producer Ryozo Tsujimoto and director Yuya Tokuda. They also mentioned that the story itself won’t just be limited to Low Rank quests: in Monster Hunter, there’s a threshold that usually comes at the end of the game’s story, where you’ll start seeing much more difficult monster variants on your hunts. That’s when you’ve hit High Rank, when you’re a true monster hunter. Previously, anything past that was for fun, there was no (or little) story. 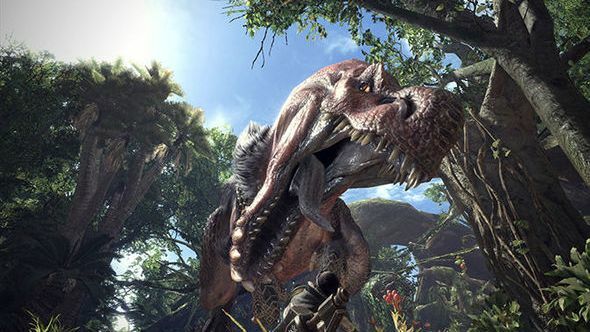 In Monster Hunter World, the story will continue into High Rank, and into the most challenging hunts. The quest structure is also changing: single-player and multiplayer quests will be rolled together now. In other Monster Hunter games, when you transition to multiplayer, you’d have to do all of the easiest quests again to unlock the harder ones, this should ease the pain of that. Ooft. That was a lot. Again, that’s all from Arekkz’s interview, which you can watch at the top of this article.